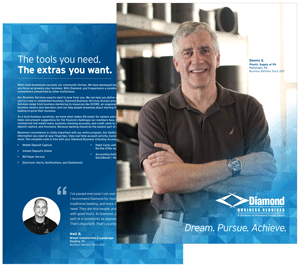 Diamond Credit Union was founded over 70 years ago to serve a local manufacturing company and its employees. Today, the relationships we have with small businesses in Southeastern Pennsylvania are still important to us. That’s why we offer an extensive list of convenient services for our local businesses. As a member-owned credit union, we celebrate your successes and we are here to help when you need it most. By providing commercial loans, business Mastercards, checking accounts, investment accounts, and more, we give our small business members access to the tools and resources they need to be successful. Request to be contacted by our Business Services representatives by filling out this secure form and a representative will be happy to answer your questions. If you would like to receive our Business Services Information Packet, please fill out this secure request form and we’ll mail one off to you.